This week a new radio show is being launched on Hippie Radio. It's called "From Me To You." It will air every Sunday mornings at 9 am, and the first show is this Sunday, March 2. The topic is Beatles music, and its co-hosts are Richard Courtney and me. It's an exciting new chapter in the WannaBeatles story, another one of those things that could have never been predicted or planned. It came out of discussions we had with Barb Deniston, the general manager of Hippie Radio, as we planned the celebration for the 50th anniversary of the Beatles on Ed Sullivan. That part of the story is covered in previous blogs. But what we didn't tell you is that we talked with Barb about the idea of a new show on Hippie Radio that would be based around Beatles music. The initial suggestion was that The WannaBeatles could host the show and have a variety of guests, with whom we could play various Beatles songs. I got excited about the idea, and wrote a theme song for it - a very Beatlesque little rock groove with 12 string, harmonica and slide guitar. Our friend Richard Courtney, whom we met when he invited us to play at the Fab Four Fest in 2008, heard about the idea and wanted to be involved. Richard and I had not worked together before, but we were excited by the prospect. We began sharing ideas about guests and themes, and meeting at the radio station to learn the production technology from Chris Luckey, who is not only the morning DJ but the master of software and production at the station. Richard brought in an impressive array of guests, starting with Tony Bramwell. Tony grew up in Liverpool, as a boyhood friend of George and Paul, and worked for Brian Epstein's management company throughout the sixties. Richard also invited Nancy Lee Andrews, the model and photographer who was Ringo's girlfriend and fiance through most of the 70's. 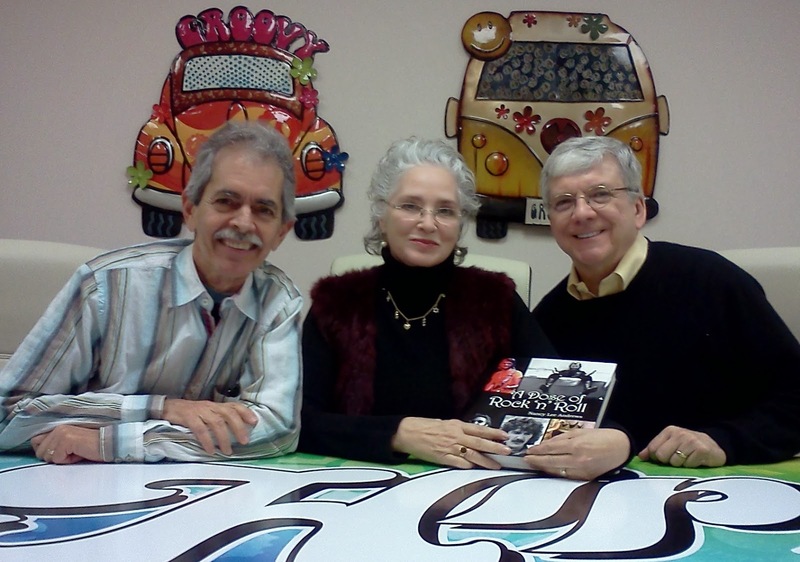 Here we are at the Hippie Radio conference table, me, Nancy Lee Andrews and Richard Courtney, with Nancy's book of photographs "A Dose of Rock'N'Roll." I invited Ken Scott, the engineer and producer whose career started with The Beatles at EMI (the original name of Abbey Road studios) and went on through David Bowie, Supertramp, Mahavishnu Orchestra, and Missing Persons, among many others. He had plenty of great stories. Barb put her sales force to work to find a sponsor for the show. Last week, she reported that the Omni Hotel had agreed to sponsor it. 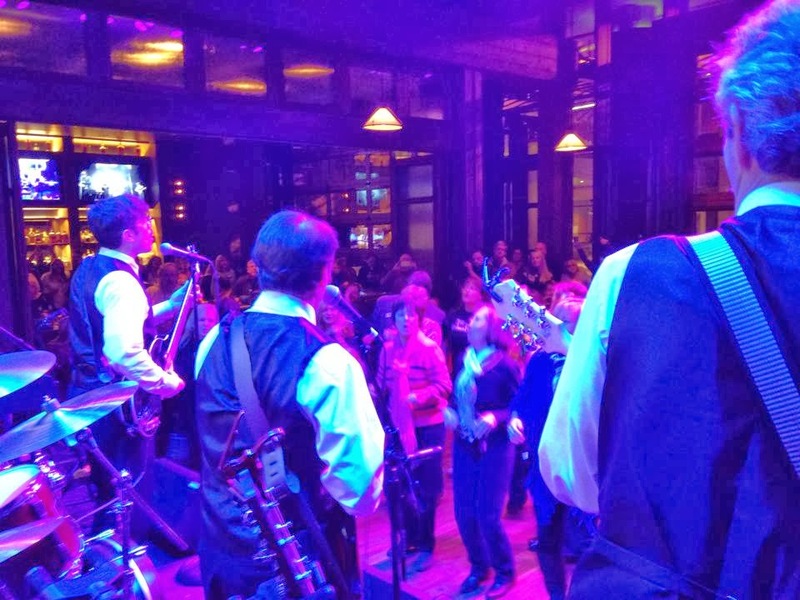 That was good news, and a good fit, since that was the hotel who hosted the Beatles celebration party we played on Feb. 9. In the Hippie Radio production studio, we watched Chris Luckey perform his magic, editing interviews, assembling music tracks with voiceover, and showing us how to put a show together. Today was crunch time, as we assembled final interviews, and inserted various songs into the software session that will become the template for each week's show. Richard and I have enjoyed putting ourselves into this process, discovering our own chemistry, laughing together, enjoying the stories of our guests, discovering obscure versions of favorite songs, and learning the technology. We hope our enjoyment comes across on the air. Tune in Sunday, May 2 at 9:00 am on Hippie Radio, 94.5 FM, and we can all enjoy the music and the stories together. You might hear us mention the WannaBeatles, and Richard's book "Come Together: The Business Wisdom of The Beatles" as we explore the music and the stories. It was the 50th anniversary of the Beatles on Ed Sullivan, "The Night That Changed America." And it was a great party at the Omni Hotel for us and over 200 fans who were there, and hundreds more who streamed it online. As previous blogs have covered, we teamed up with Hippie Radio, who secured the Omni as the location. 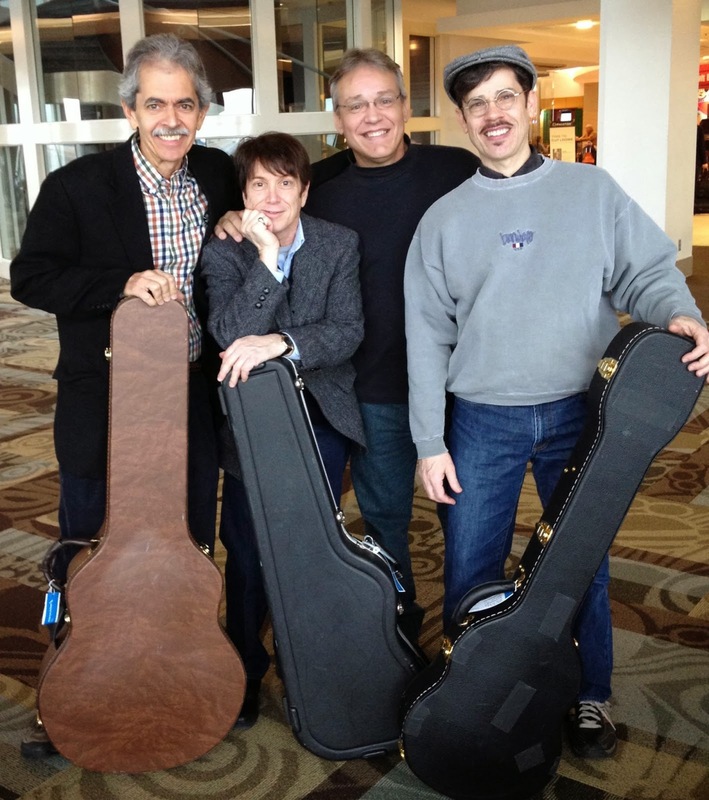 We also had help from our friend Richard Courtney, for whom we wrote and performed a new jingle, "Real Estate Man." There were technical details to deal with, from the video that goes along with our show to the five camera coverage that Hippie Radio arranged through Music City Roots, which gave online viewers a chance to see what was going on. So we arrived early at the Omni, to get everything set up. Kellie, the vivacious publicity director who had worked with us on the photo session two weeks earlier, was very hospitable. She gave us complimentary valet parking and a hotel room, then took our orders for a complementary meal from their hotel menu. We worked with the Barlines soundmen Kyle and Max, in addition to our usual sound man Allan Waugh. Barlines is an usual room, being shaped like a large "L." It has artwork and decorated mirrors commemorating many concerts and major artists who've played Nashville in the past. Another feature of the room is a huge screen behind the stage, usually devoted to sports games, but tonight showing videos stored in Dennis's laptop. Those include footage from the Ed Sullivan show, along with different videos for all the songs in the show. To keep us in sync, the video output is connected to a set of earbuds worn by WannaBeatle David during that Ed Sullivan footage. Hippie Radio had been advertising the show for two weeks, so there was a good turnout. The doors were supposed to open at 5 pm, and by that time over fifty people were lined up in the hall outside the door. We decided to serenade them, playing an impromptu strolling version of "Nowhere Man" as we walked by them on the way to the elevator to get to our dressing room. 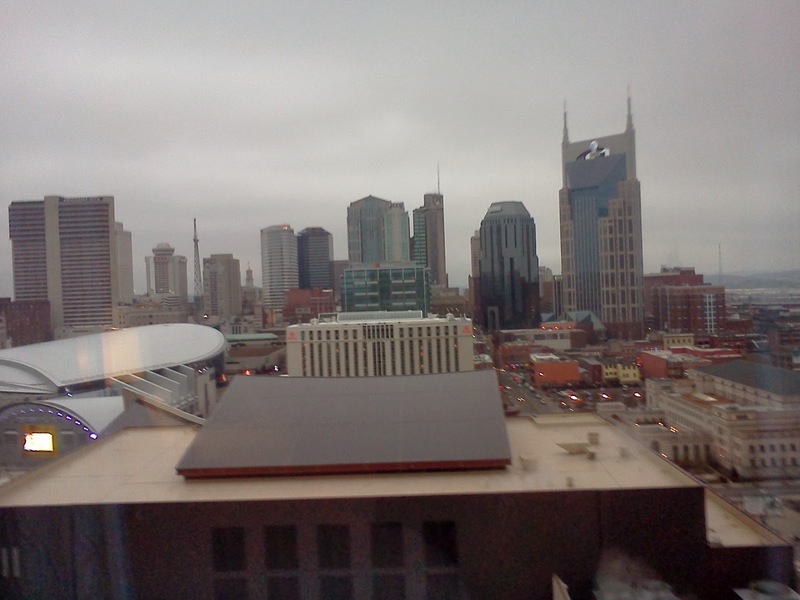 Here's the view from room 1349, where we ate our chicken club sandwiches. Our friend John Foster went onstage at 6 pm, playing a wide variety of pop tunes, including a bit of Beatles. The crowd that had overflowed Barlines was directed to the nearby Bongo Java, where they could view a large screen TV streaming the show directly from Barlines. The streaming was the high-tech feature that distinguished this particular gig. Thanks to Hippie Radio providing the camera crew that works for Music City Roots, we had five cameras and professional video editing for the entire evening, and could invite our friends and family all over the world to watch the show on their computer. The other thing that was exciting was just the energy of so many people enjoying Beatles songs. At one point, a group of enthusiastic listeners rushed the stage, screaming, probably doing just what they did 50 years ago when they were a lot younger. 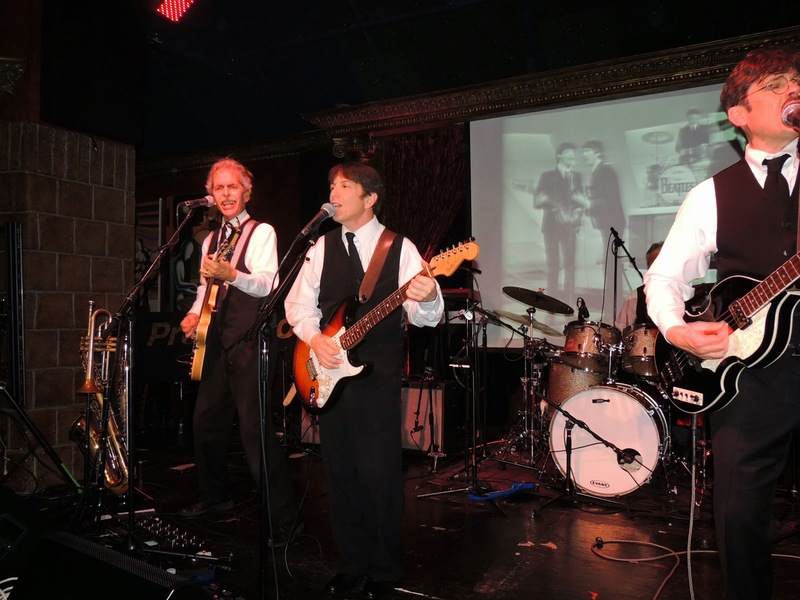 We opened our set with "Because They Were Fab," our special tribute to the emergence of Beatlemania in America. After the Ed Sullivan segment, we played a wide selection of Beatles songs, from the early to the late, from "Hold Your Hand" to "I Am The Walrus." But we departed from the Beatles song list in our own special way, which included Dennis's parody of "Yesterday," "Creme Brulee." We played "Daydream Believer" in honor of Davy Jones and The Monkees. We played our brand new radio jingle for Richard Courtney, "Real Estate Man," while Hippie Radio DJ Chris Luckey recited the text onstage. We also played "In '63," which has been getting airplay on Hippie Radio lately. One of the great summarizing statements of the night was from Barb Deniston, the general manager of Hippie Radio who has put so much effort into making this celebration a reality. She reported that when we played "In '63," she saw people singing along. That's a thrill of another level, a communal moment sparked by the magic relationship between musicians, their listeners, and the essential catalyst of radio. Barb's collaboration with us has been just as creative and exciting as any songwriting session, and we're grateful for the opportunity. What happened that night, as we celebrated what happened fifty years ago, is that we saw the emergence of a new community, people who love music and are happy to show it. At one level, it's the boomer demographic, as specifically targeted by Hippie Radio. But it's not limited to any certain age bracket. Most of them are old enough to remember the thrill of the music in its first appearance, but many are younger, and drawn to the energy of the songs themselves. Music can be analyzed endlessly, but when people enjoy it, no extra explanations are necessary. We're very happy to be part of it. The WannaBeatles have been playing together for six years. It took us that long to get ready for New York. All in one unforgettable day, February 1, we woke up in our hotel on 47th St, walked with our gear down to the Fox studios on Sixth Ave., rehearsed and performed on national television, then loaded our gear into a van to drive down to 32nd St. to load in, sound check, and play a show at The Cutting Room, where we got the crowd on their feet dancing. It was an amazing and energizing experience. The key piece of the puzzle was getting on Huckabee. We had actually talked about it years ago, almost as a fantasy. 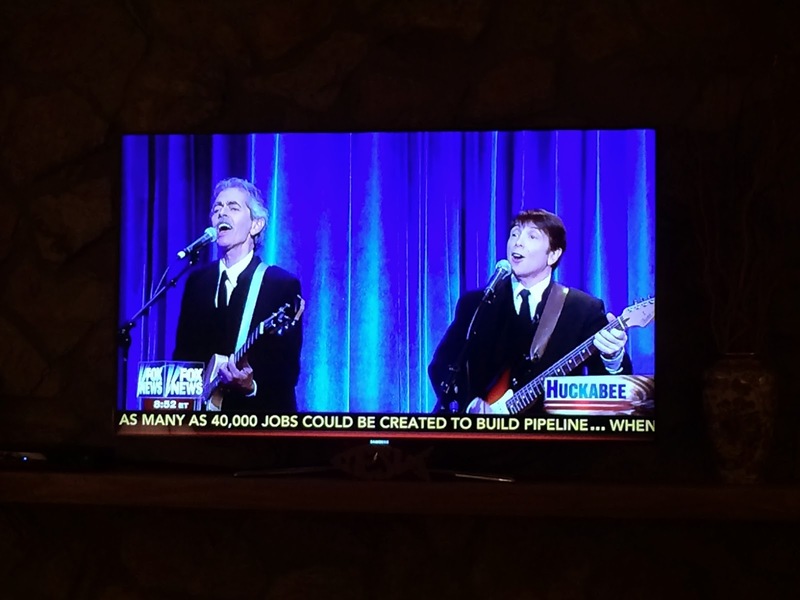 "Hey, Huckabee plays bass. Wouldn't that be cool to be on his show, with him playing bass with us!" WannaBeatle Dennis handles our business. He's our resident Brian Epstein. He's the one who envisioned our doing something on national tv to tie in with February 9, 2014 being the 50th anniversary of the Beatles on Ed Sullivan. He's been after it for months. After tenacious promotional efforts with various shows and agents, last December he gained for us a tentative okay for us to appear on Huckabee. Dennis then met and began working (via email) with Dixie Owens, a publicist with extensive connections in the world of television. Huckabee is a weekend show, recording only on Saturdays. They already had a band booked on Feb. 8, so we opted for the previous Saturday, Feb. 1. Dixie became our advisor and go-between, talking to the talent coordinator from the show. She even pitched us to other shows. We considered an opportunity to appear on CBS morning show that same day, but the schedule was too tight - along with the budget. We had a dose of Big Apple reality when we heard that appearing on CBS would cost us approximately $3,000. Performers are required to pay all the production costs along with union contributions. The Huckabee show was relatively generous. They provided all the production support needed and booked and paid for our plane tickets, hotel rooms, and the transportation to and from the airport. That made our trip possible. Dennis also contacted a NY booking agent, two weeks before our trip, who got us a gig that Saturday night at The Cutting Room. The extra gig meant staying over Saturday night, which took some extra planning, as Dennis found us a second hotel right next door to the Cutting Room. So the trip was on, and we had plenty to do to get ready. 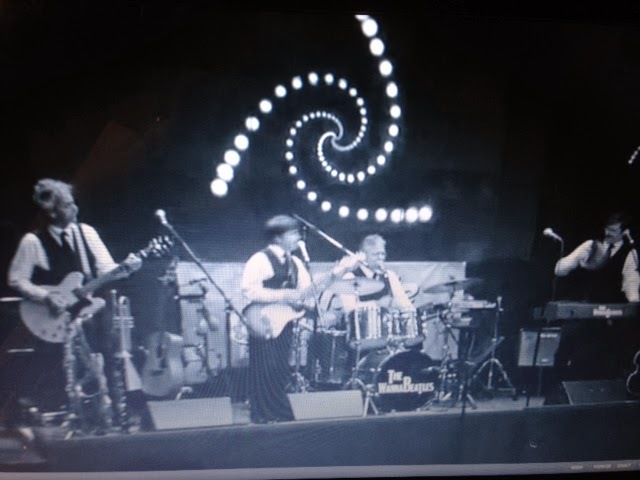 As covered in last week's blog, we put a lot of effort into the music: the four minute medley of Beatles songs we worked up, along with our song "Because They Were Fab," which would be played as a reprise before the show fades to commercial. But we had other things to deal with too. Equipment, for example. This was our first fly date. Every gig up till now we could carry whatever we needed, either in our four cars or in a van hauling a U-Haul trailer. The Huckabee show provided full instrument rental. That included a drum kit, a full size keyboard, a sample pad, and two guitar amps. That left us with responsibility for two guitars, plus pedals, one bass, and five horns, plus minor percussion and adapters. We also had to bring a laptop for the video that plays during the show. 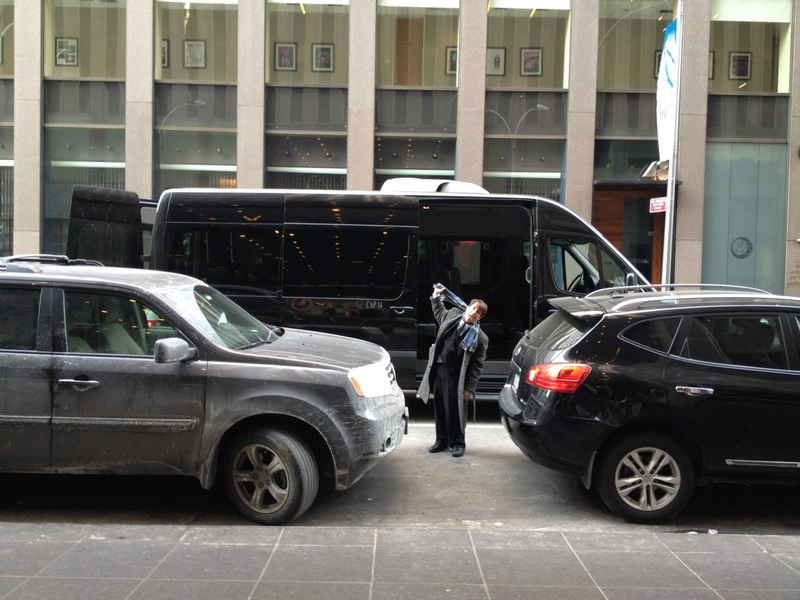 In theory, we could have rented horns in New York. We wanted to have our full arsenal of instruments available for the Cutting Room show, and it made more sense to take along horns. It was Tuesday the week before our departure when we received notice of our airline flights. 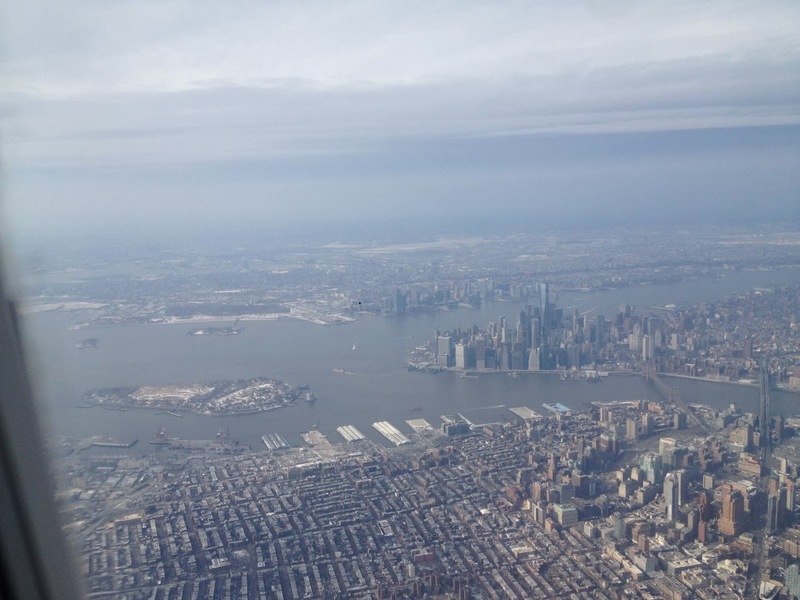 It was on American Airlines, nonstop, round trip Nashville to La Guardia, leaving on Friday, returning on Sunday. We began to investigate the airline luggage policies. We looked hard at what we needed, and ways to pack the extra gear that would work. David's rugged cymbal stand case, which was otherwise perfect for holding the soprano sax, cornet, guitar pedal, and other items, exceeded the 62" size limit, and also the weight limit. What we came up with as a creative alternate was using larger suitcases, with foam padding. The challenge was to find something wider than 27", which is the length of the soprano sax case. Nathan brought a suitcase from his basement which was about 40 years old, but it still worked. It didn't have wheels, but it had the dimensions we needed. I brought a suitcase from our basement which had wheels and expandable handle, but not enough length for the soprano sax case. Into Nathan's antique behemoth we squeezed the soprano sax and my guitar pedal, clarinet, cowbell, and interface boxes for connecting the laptop to the sound system, in addition to my clothing and toiletries. Into my less spacious suitcase went the cornet, flute, wireless system, sax stand, and cables. Dennis brought his bathroom scale into the studio where we tried out these various packing arrangements. We put the suitcases onto the scale. At first the behemoth came to 58 pounds, so we had to ditch a few items to get the weight down below 50. We kept looking for places to put the extra items, and finally got everything distributed. 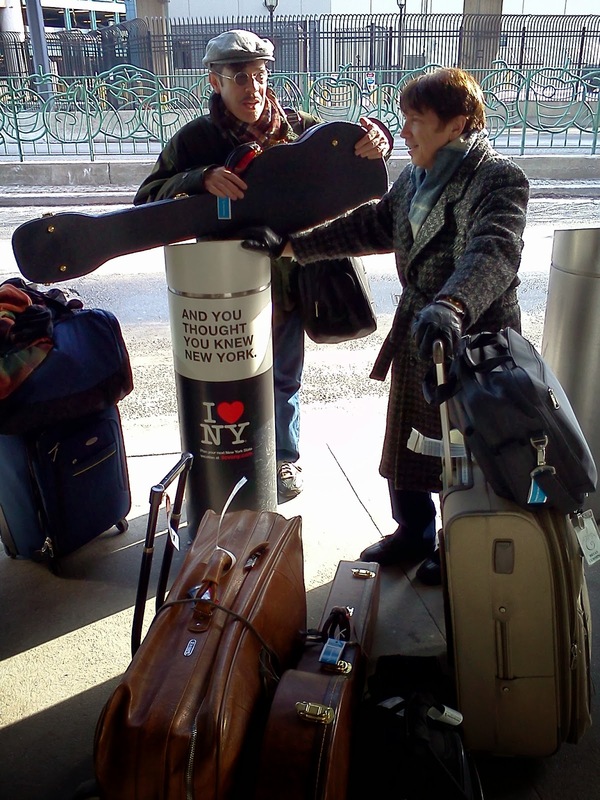 Friday morning, we arrived at the airport, checking our bags (but not guitars) at curbside. Each suitcase came in under 50 pounds, and since there were four of us, the four checked items were $25 each, their lowest rate. So far so good. We didn't have flight cases for the guitars, but we knew they were too big to put into overhead bins. We discovered an in-between category. if you carry your guitar onto the jetway, they'll give it a red "Valet" tag and put it in special handling right before you step onto the plane, and then you get the guitar back as you deplane, before you leave the jetway. A casual shot at the gate before boarding. 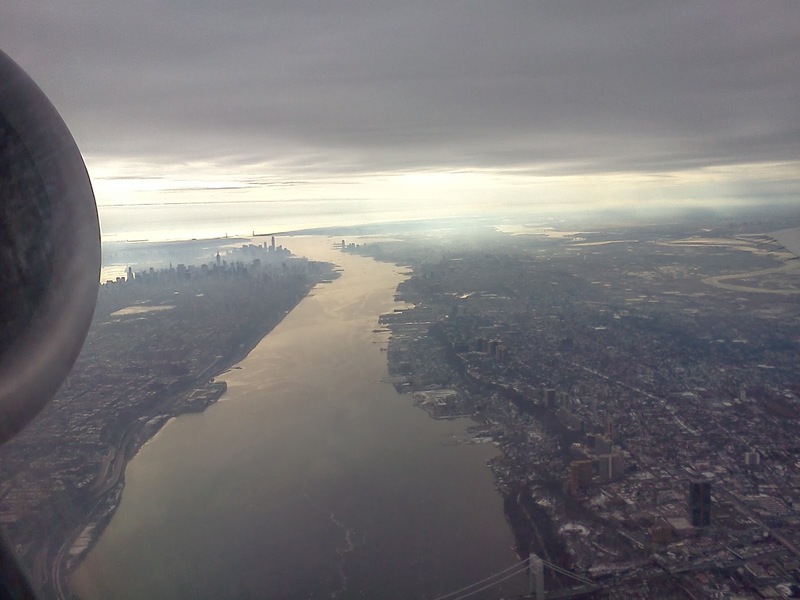 David caught a nice shot of the New York City skyline out his window as we approached. Wannabeatles Nathan and Dennis waiting curbside at LaGuardia. Our driver was from Bangladesh. He took us through the midtown tunnel into Manhatten, and drove across town on 42nd Street, where we saw the Library and plenty of typical New York sights and sounds. Dennis said "This is what I moved away from." I was sort of excited to be there, to feel that energy, to see those famous sights along streets all laid out in a grid. We got as far west as Sixth Avenue, then turned north. When our driver tried to turn left on 47th, a policeman stopped him, telling him to go down to 49th and come back. But our hotel was on 47th, so there was no place closer than where we stopped on Sixth Ave.
We had about half a block to walk, to the Night Hotel, which is easy to miss from the street, but once you enter, you're in a different world. The hotel is fairly small, but very modern. 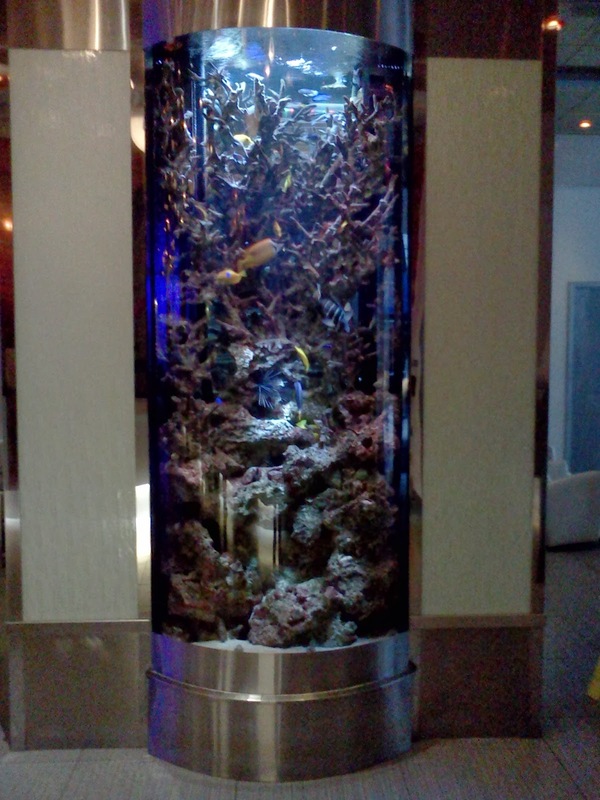 They have a fancy aquarium in the lobby. The elevators were small and slow, and the rooms too. The large suitcase Nathan had contributed was too wide to enter the elevator; we had to turn it upright. Carrying all the luggage and guitars too made us a cumbersome looking team. 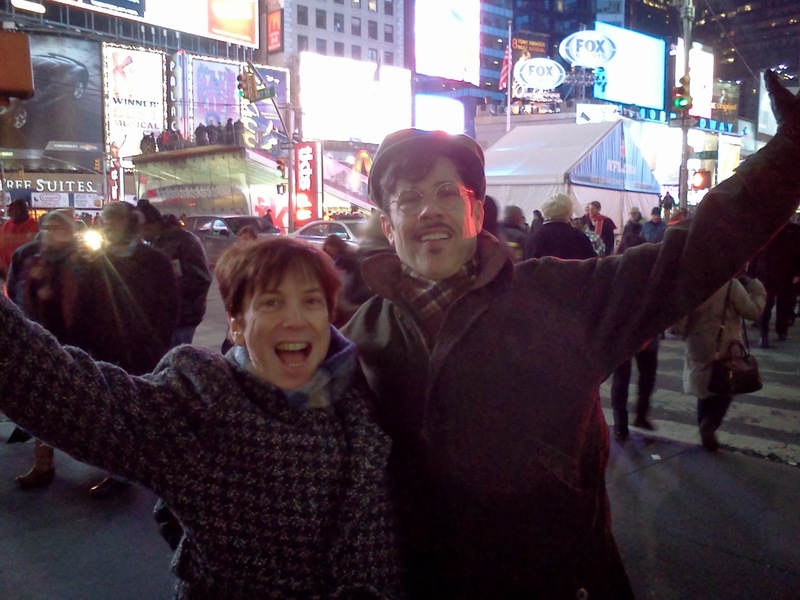 We had some time to walk around in the afternoon, so David and I took off through Times Square. It was even more crowded and crazy than usual, because it was Super Bowl weekend, and the streets were full of extra tourists and football fans. There were even games and television cameras set up along the street, all part of NFL promo efforts. Since we were only a block away, I went over the 48th St. to check out the music stores. 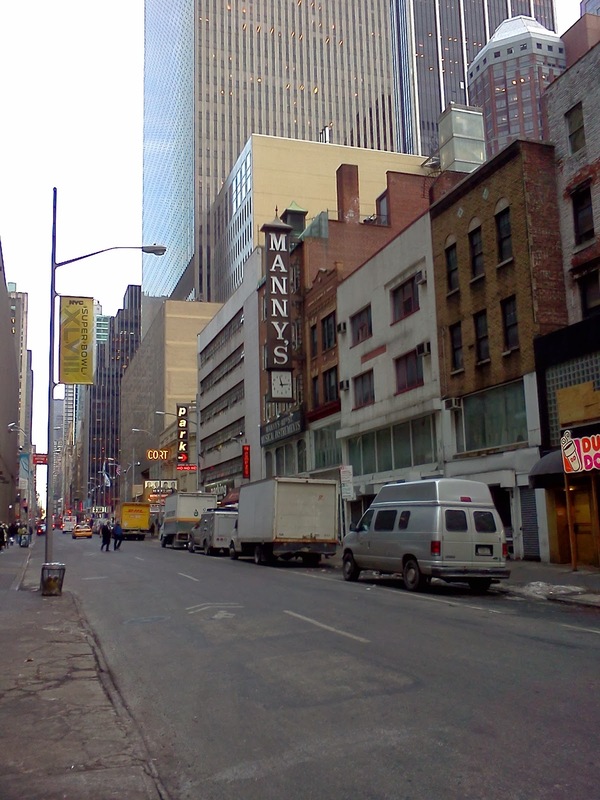 There's still a sign there, but Manny's has been gone for 15 years. It was bought, we discovered, by Sam Ash, which had been the music store next door, but Sam Ash moved to 34th St. Even Rod Baltimore, the great sax shop on 48th, was gone. But we found out it had move two blocks over, to 46th St.
We went there, admired all the horns on display, and chatted with John Baltimore, who showed us photos on his wall of great sax players like Michael Brecker, and gave us some of the local free Jazz publications, which were loaded with news, reviews, and ads for clubs and records. 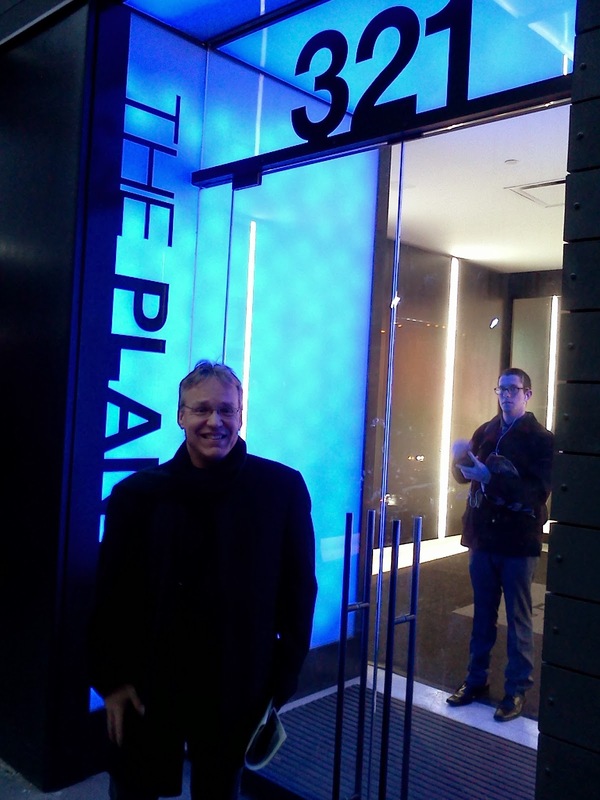 One other spot I wanted to check out was The Record Plant, the studio where I had worked back in 1974, when I lived in New York. I thought I remembered it being on 45th St., but it was 44th. I led David down 45th without seeing anything familiar, then asked him to google it on his iPhone. 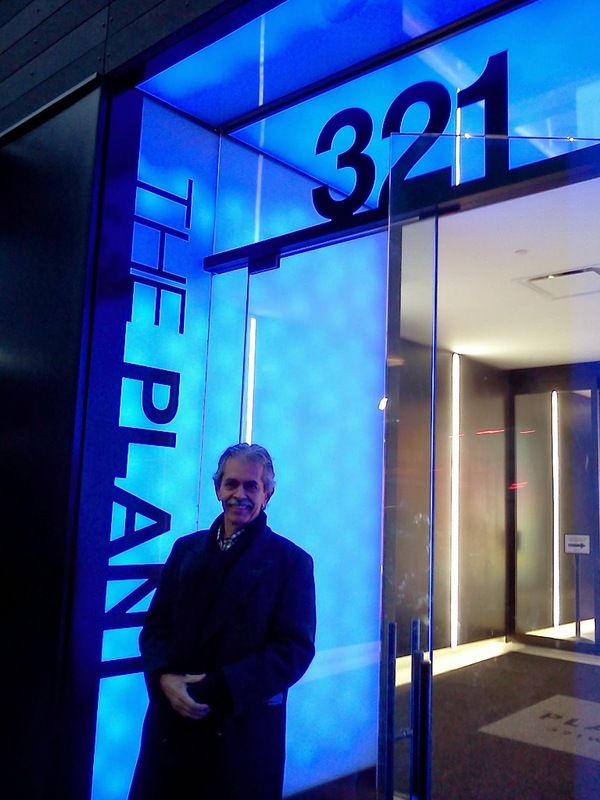 He found the address 321 West 44th St., but also discovered that The Record Plant had been out of business about as long as Manny's. I worked at the Record Plant working with Martin Mull on his album "Days of Wine and Neuroses." Martin had two albums out on Capricorn at the time, and was starting to get known as a very funny guy, talented and quick, who could make conversation with just about anyone. We learned while working on the first floor at the Record Plant that John Lennon was recording there up on the tenth floor. Martin called up to see if it was okay for him to drop by to say hi, and he took me along with him. Martin and I got off the elevator, and walked down the hall, seeing John Lennon sitting there with some of his musicians. John knew, or at least had heard of, Martin, which made it okay. He smiled and shook his hand. Martin introduced me. I said hi. That was it. It wasn't that exciting, or earth-shattering. I wasn't someone who could carry on a meaningful conversation with John Lennon at the time. I certainly didn't want to burst out with any foolish statements that would make Martin regret he had brought me along. Being cool and saying nothing was about all I could do. So we were there for about a minute of casual conversation, then we returned to our studio to do our own work. The Record Plant was quite a place. While we were busy on the first floor, Aerosmith was on the second floor, recording their album "Rocks." 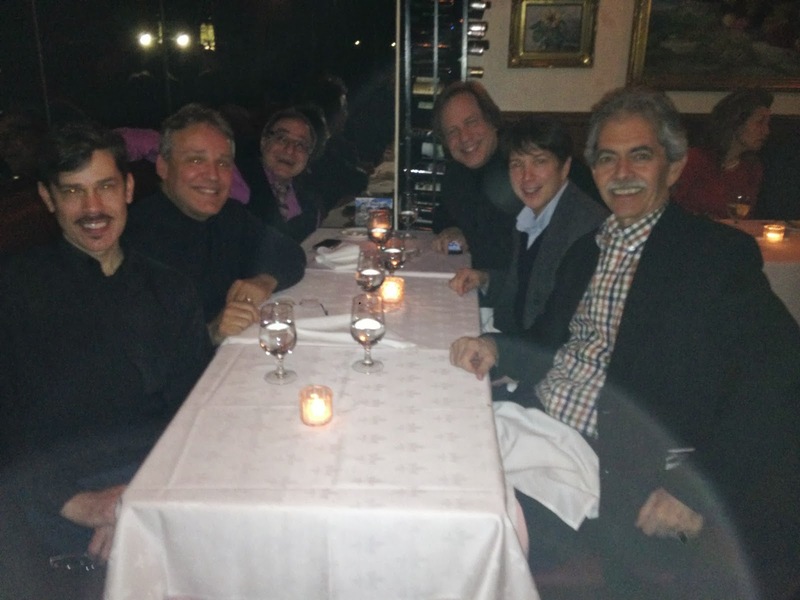 Again, Martin was happy to network with other celebrities, and he invited SteveTyler to join us for background vocals on one of our songs. If you ever find an old copy of "Days of Wine and Neuroses" at a used record store, you can find Steve Tyler's name there among the background singers on the back of the album. OK, so fast forward to 2014, with WannaBeatles David and Bryan walking down 44th Street, looking for this studio that doesn't exist anymore. 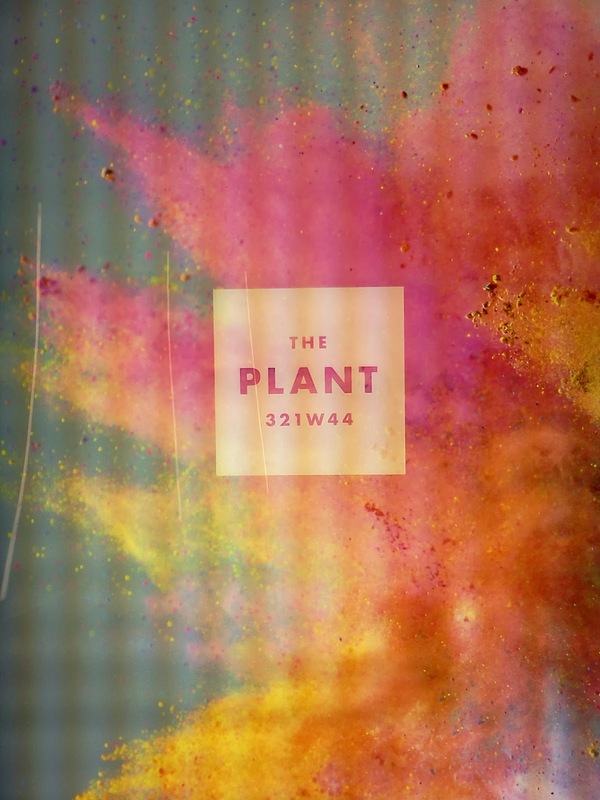 What we find is a place called "The Plant." Here's the artwork displayed in the lobby. At the reception desk, we talked to a young man who works there, who told us that it is now a studio owned by Puff Daddy, or Sean "P. Diddy" Combs, called Daddy's House. He told us that Sony also owns a mastering facility on the tenth floor. It's still a studio, but not open for business like it used to be. The young man was named Cornell. I asked him if he'd heard of Cornell Dupree, the great R&B guitarist, and he hadn't. But he still showed us the studio, and introduced us to some of the other people who worked there. One guy, Tony, had been the studio manager at Columbia for ten years, and remembered times when Springsteen and Led Zeppelin had recorded at the Record Plant. 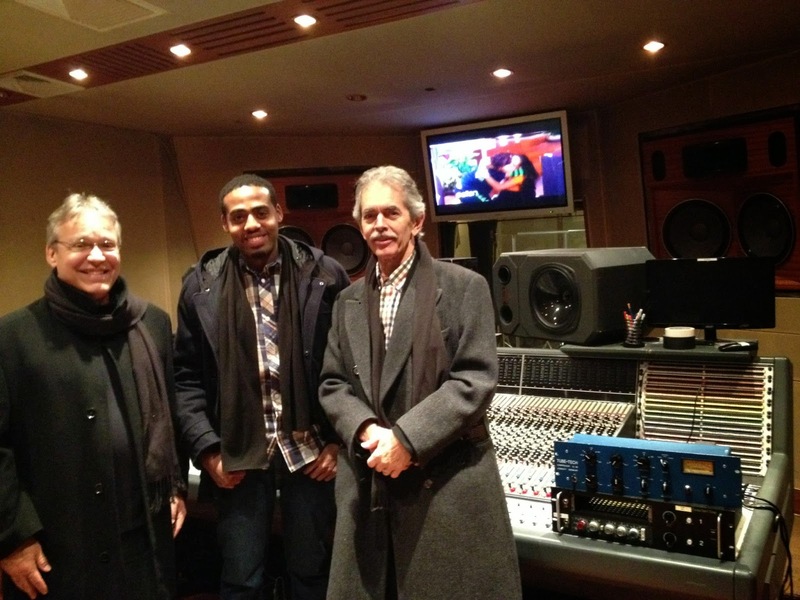 David, Cornell, and Bryan at Daddy's House Recording Studio. We had a great time hanging out at Daddy's House with Cornell and the other guys at the studio. David and I took pictures of each other at the doorway as we left. Walking back along 44th, we discovered Birdland - "the Jazz Corner of the World" - right next door. Charlie Parker's name was actually on the awning. Even though this was not the original location, the club clearly made its connection to the earliest days of bebop, another indicator of New York's status as the center of musical creativity. We were back at the hotel just in time to leave again for the dinner Dennis has arranged with his buddies. They had selected DaTomassso on Eighth Ave, between 56th and 57th. 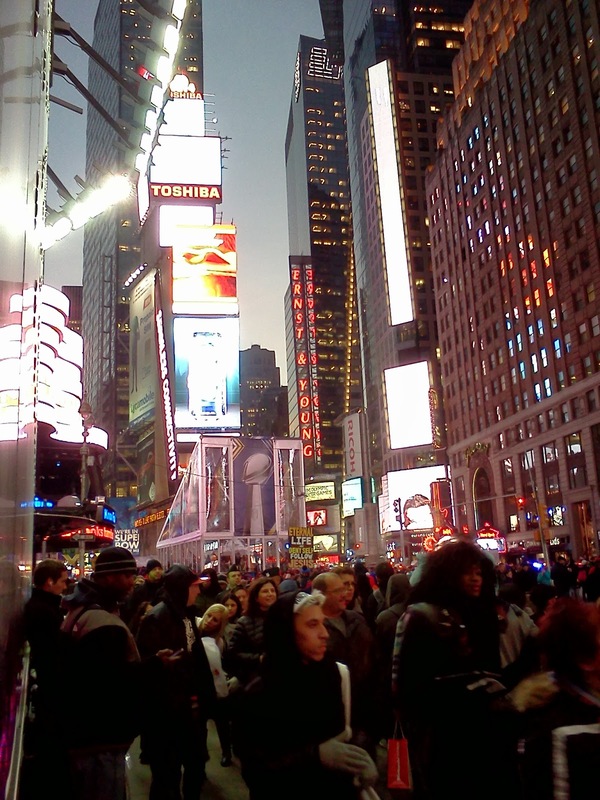 It was a cold walk through Times Square and over a few blocks, but it was great to catch the sights of all the theaters. We even walked by the CBS Theater, currently housing the David Letterman show. That was the spot where the Beatles played their historic U.S. television debut. The restaurant was nice but not too fancy - white table cloths, waiters with Italian accents, delicious food and wine, but not overpriced. Manicotti stuffed with spinach, a glass of chianti, asparagus with parmesan cheese, tiramasu and coffee for $45 including tip is fairly modest for New York. Even better than the food was the company. Jeff Martin and Jimmy Roberts are both old friends of Dennis's with extensive experience in theater and music. We learned about the new Rocky musical, having just seen the huge marquee with the slogan "Love Wins," which is in rehearsals. We learned that Times Square had been bought out by NFL to use as a party zone for football fans visiting to attend the Super Bowl. It explained the crowds, and the extra police presence, and the fact that our driver couldn't turn onto 47th St. to get to our hotel. Dennis & Nathan enjoy the festive atmosphere. We all had individual rooms at the Night Hotel - ridiculously small, but nice enough. I watched CNN The Sixties, The British Invasion, which was a very appropriate program. Saturday morning we checked out and walked down 47th Street to the Fox building, carrying all our luggage, which meant a minimum of three bags per guy, and Nathan's behemoth strapped to a set of wheels that Dennis had diligently remembered to bring. We were greeted in the lobby by Ken, a tall bearded guy in glasses, who got us passes and led us up to the studio. We had a green room, with a comfortable couch and small kitchen with coffee and snacks, and adjoining dressing rooms. 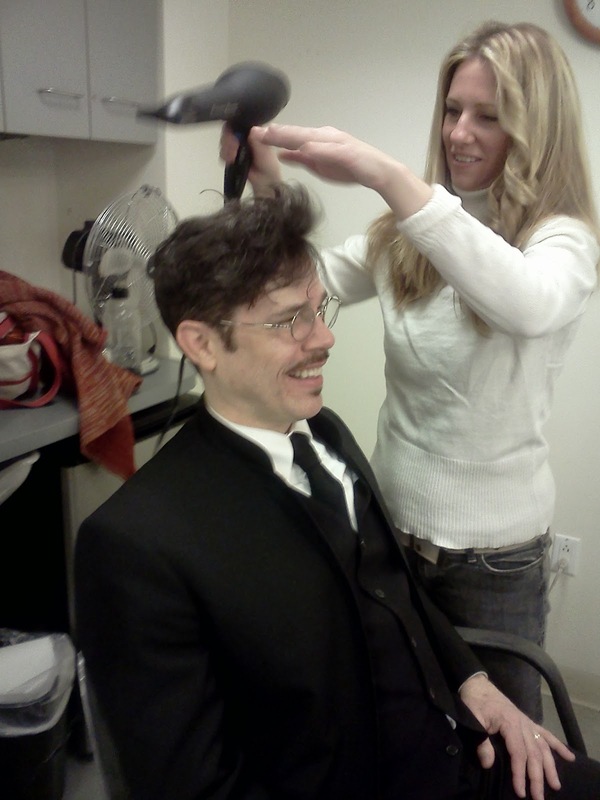 Nathan in the makeup chair, getting his hair professionally volumized. We walked into the studio, where drums, two Vox amps and keyboards were already set up. The sound technicians were excellent, very efficient, and we got great sound in our monitors. It was nearly noon when Huckabee entered, and we had a chance to talk with him, which helped us connect with our reason for being there. Mike Huckabee, like millions of others, got inspired watching The Beatles on Ed Sullivan 50 years ago. He asked his parents (who said "Turn it down!" when the Beatles played on tv) for an electric guitar for Christmas, for three years in a row. Finally, the young Mike Huckabee gave his parents an ultimatum, saying "I don't care if I don't get anything else for Christmas, as long as I get an electric guitar." His parents found one in the J.C. Penny catalog for $99, which took them a year to pay for. Huckabee told us about growing up poor in southern Arkansas and being a shy kid. He once got cast in a school play to do nothing but close the curtain after the show, and when his moment came, he froze. That's how shy he was. But, he says, the electric guitar helped cure him. While he was governor of Arkansas, he formed a band with other staffers who worked there. The band was called Capitol Offense. They played gigs, even opening for Willie Nelson, who later appeared as a guest on his show. Gov. Huckabee told us about guitars he has collected over the years: a Rickenbacker electric, a Gretsch Country Gentleman, and a Hofner bass, which he proudly displays in a case. For those who don't know, those are the specific instruments played by John, George and Paul on Ed Sullivan. 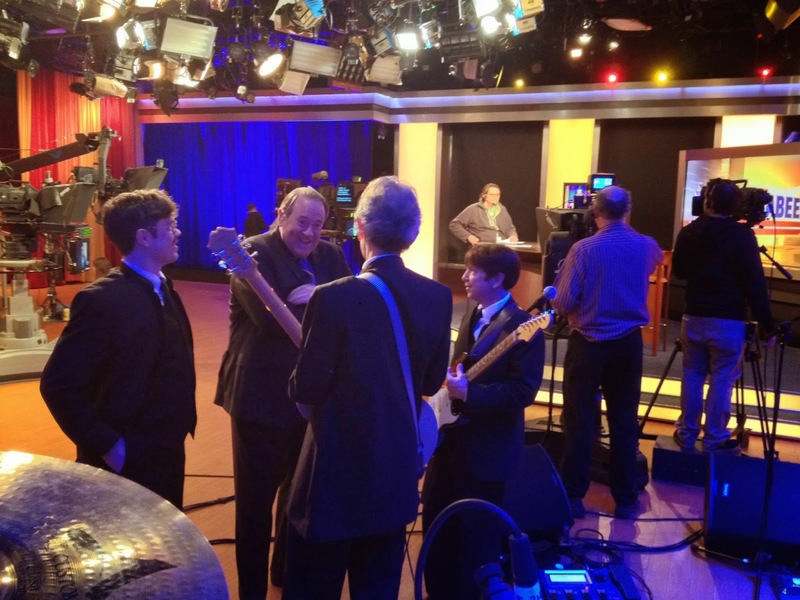 The Governor chats with the WannaBeatles before the show. We went through our medley about 4 times with the Governor on bass. He was reading the chart Nathan made. One spot where he had trouble was the chorus of "Help!" where the vocal goes up to "Please, please help me." There are musical reasons why the conclusion of that chorus is hard to hear. The last word "me" comes on a downbeat, with the chord being A major, the key of the song. What's unusual is that the preceding bar, rather than being a chord that leads to A, is also an A chord, and further complicated by a deliberately complex guitar figure that brings tension and ambiguity to the chord, making it feel very unlike a "one chord." One could make a case for The Beatles using musical elements that had never been used in pop music before to create specific emotions. At any rate, we played through that section a few times, so the Governor could get used to it. After our run through and rehearsal, the audience came in, filling about 60 seats on one side of the studio. Our segment was to be used in the final ten minutes of the show, but it was recorded first. The Governor, wearing his bass, introduced us as "the ultimate Beatles Band," and interviewed Dennis before we launched into "I Want To Hold Your Hand." We made it through our medley just fine, although we didn't feel as together as we had during the rehearsals. My mistake came soon: that note that George Harrison plays right before the verse I've played correctly dozens of times, including all the rehearsals, but somehow my brain told me to hit the B string rather than the G string, and I played a note that was approximately a fourth too high. I was wishing I hadn't done that, but there wasn't much I could do. The show must go on. Dennis also had a problem with his guitar pedal during "Sgt. Pepper," accidentally activating a horn sound at the wrong time. But it was barely noticeable to anyone watching. We survived. 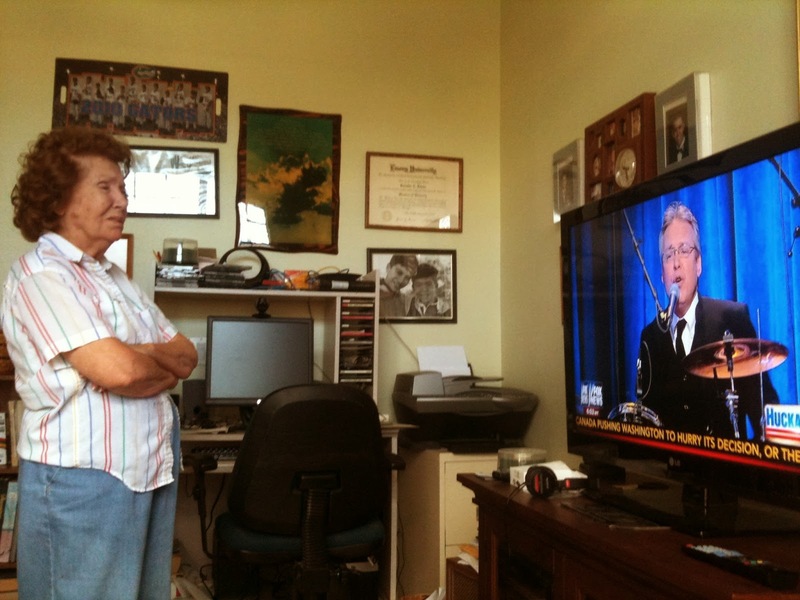 After the show, David received a photo of his mother watching him on tv. Proud Mama watches her son on tv. We also had a chance to play our entire version of "Because They Were Fab," although we knew that only a few seconds of it would appear on television. The Governor also mentioned our CD "We're Still Rockin'" being available at iTunes and on our website. Then it was time to pack up and get our gear into a van to head over to The Cutting Room. This time our driver was from Poland, a balding middle aged jazz fan from Krakow. 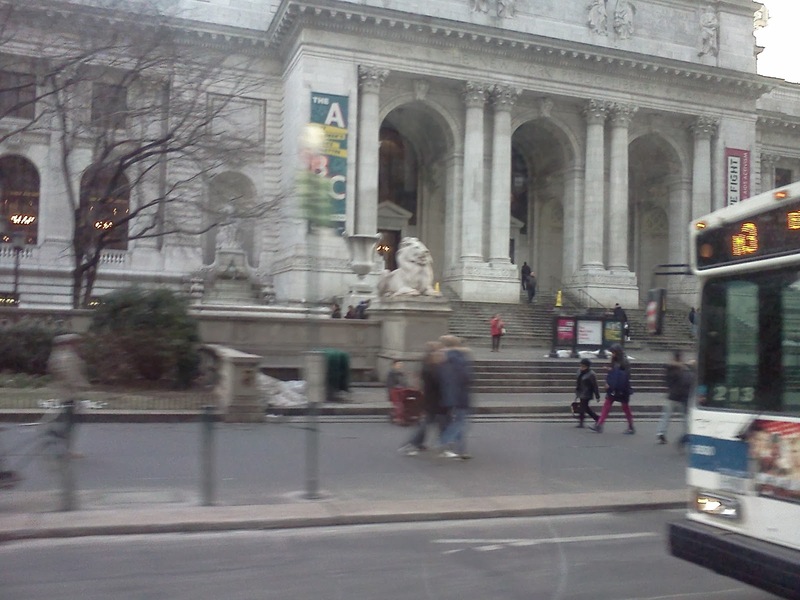 He drove us down Fifth Ave. by the New York Public Library, and right past the Empire State building. 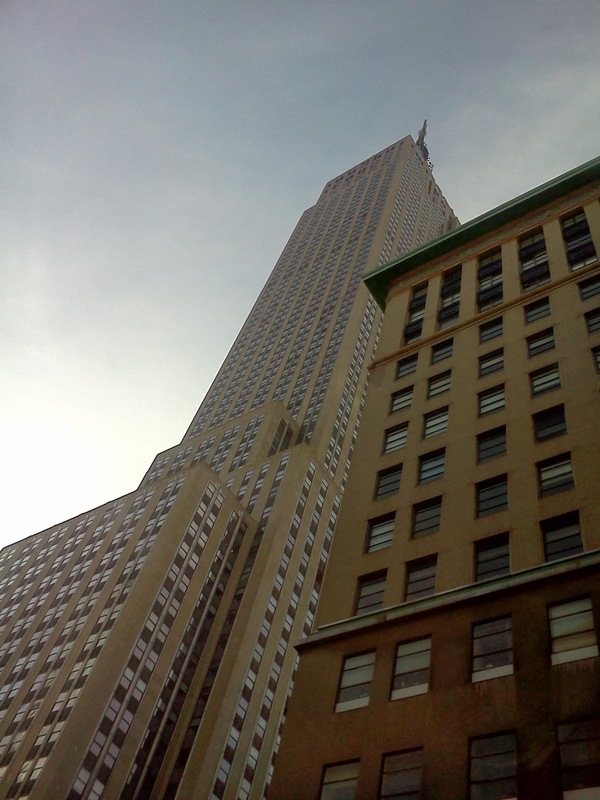 Empire State Building, looking up from Fifth Ave. It was another New York moment as we arrived at The Cutting Room to discover a photo shoot in progress at the club, with several scantily clad ladies holding firearms as they posed along staircases for photographers. Wide-eyed WannaBeatle Nathan wondered if perhaps we had accidentally arrived at a bordello. But it was The Cutting Room, in temporary use as a fashion location. We carried our gear around the photo session to the back room. We set up our gear in an area to the left of the stage, while another band did a sound check. 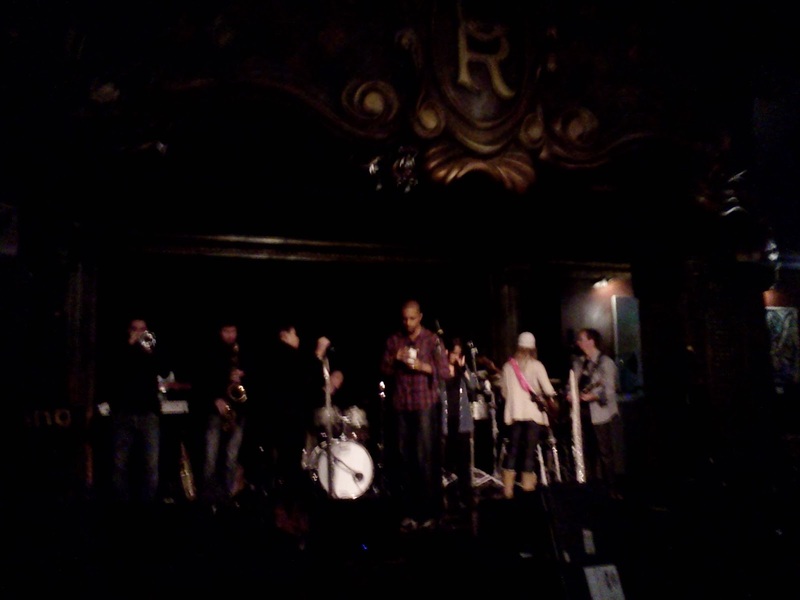 That was Boogie Wonder Band, who were scheduled to play after us, at midnight. Boogie Wonder Band is a full-scale disco band, with three singers, two horns, percussion, on top of the usual rhythm section, including a female bassist, so that sound check took about an hour. However, it was very professional and organized, each musician playing only the notes that would help the sound man get his levels. We heard them speaking French to each other, then found out they're from Montreal. They sounded great at the sound check, and were very cooperative about moving their gear to make room for ours. Then it was our turn. We ended up using their drums, and some amps the club had. We set up our equipment and started to get our sounds. At one point, Nathan's keyboard starting acting strange, and failing to play. He, and David, and our sound man Gerard, all gathered around to figure out what it might be. After logically eliminating the audio portion of the equation, and after Dennis's phone calls to the rental company, Nathan discovered a light beside a button which affected the attack of each note, which would make a note silent even as the sound is being activated, if the attack is set to a slow value. After he discovered and pressed that button, the keyboard worked fine. But it took nearly half an hour of stressful troubleshooting to get there. During that process we came to appreciate Gerard, our sound man. He was very aware of technical details, and patient with problem solving. He also provided us with a classic New York diatribe, as he addressed the waitresses who were preparing the silverware at a table in front of the stage while he was in the balcony, trying to get sounds. He announced over the PA system, "Please continue making noise with the silverware. Never mind that I'm trying to get the sounds for the show. Maybe I can return the favor someday by showing up at your wedding and loudly throwing knives and forks against the wall." Those are not his exact words, but the way he did it was priceless. Even Dennis was impressed, saying "I wish we had recorded that." Although Gerard's speech was totally sarcastic, it was also creative, well-delivered, and it carried an undercurrent of affection. It was like a spontaneous comedy skit. It was totally New York. The show went well. Dennis and I both invited friends and family who live in New York, who showed up and brought friends of their own. We attracted about 60 people, and they were very enthusiastic. In fact, we even got people up and dancing. That felt great. After the show, we were exhausted from our long day, but exhilarated from the response. Gerard and the club manager said we rocked. Members of Boogie Wonder Band who heard us said the same thing. Their manager wanted to book us in Montreal, and asked about places in Nashville. We had two minor issues before we could pack up and leave. One was Nathan's wallet, which he had put into a coat pocket, but it was no longer there. Another was the small antenna from my wireless transmitter, which had come out during one of my solos as I left the stage. In fact, it was my first time to leave the stage, and my guitar completely quit during that moment, so I had no choice but to return to the stage, unplug the wireless, and play the guitar directly through the floor pedal for the rest of the show. David said he prayed that we would find Nathan's wallet. And we did, under a chair where the coat had been. And within a few minutes after that, I found the small antenna for my wireless unit on the carpet beside the stage. I told David that his prayer had lingering power. We got packed and took our stuff back to the hotel next door. The rooms were slightly larger than the ones the previous night, but the elevators were still very tight for four of us squeezing in with all our luggage. 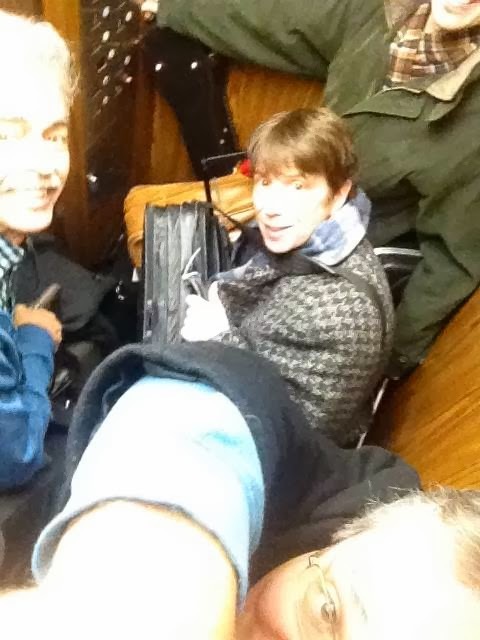 David took this photo of our last elevator ride in Manhatten that Sunday morning. 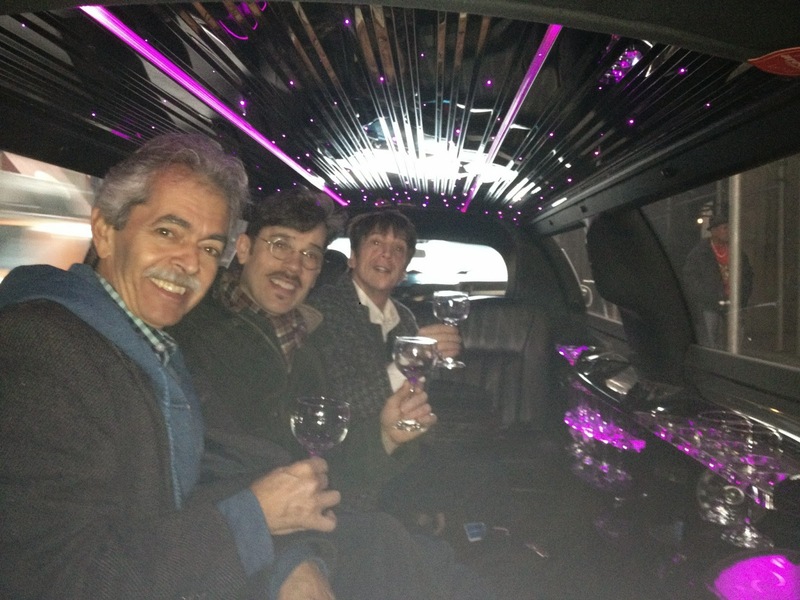 We gathered for free coffee and muffins in the lobby, then got into a limo for the trip back to LaGuardia. It was one of those fancy ones, with glasses lined up for the passengers to drink. We held empty glasses for a photo op. Checking in at LaGuardia, we ran into John Cowan, who had been in NY to play the NHL Hall of Fame with the Doobie Brothers. Cool gig. But we were happy receiving all the phone messages, texts, and Facebook greetings from friends and family who had seen us on national tv. It was very encouraging. We knew we had reached a new level as a band. Another treat for us on this trip was having WannaBeatle Dennis for our road manager. Every step of the way, from parking at the airport, to securing limo rides in the city, from booking our hotel rooms, to checking luggage curbside, he was on top of it, smoothing our journey by knowing exactly when and how much to tip each guy along the way. Dennis played the role of papa taking care of his family of little WannaBeatles. We left New York just in time to miss the Super Bowl traffic. It was a great trip, and it was great to get home.